Here we go! 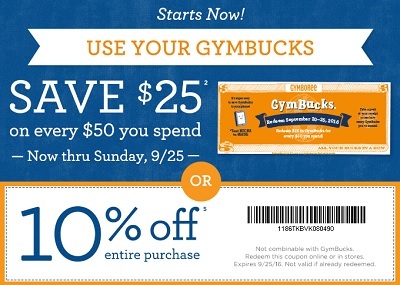 Bring your Gymbucks to your nearest Gymboree store location in the U.S. or visit the official website and save $25 on every $50 you spend. Don't be sad If you don't have Gymbucks you can still save money. Print a special coupon and save 10% on your entire purchase. Cannot be combined with Gymbucks. Source of the information is Gymboree. The offer is valid until September 25, 2016. For more details visit any Gymboree store location in the U.S. or Gymboree online.